The reader might think that my big event for last weekend was the Eisner nomination for “The Best of Simon and Kirby”. As great and unexpected as that was it was far from the most significant event. No, my big event was completing the final pages for “Simon and Kirby Superheroes”. Doing the art restoration for that book was an arduous and lengthy process. It began about a year ago at a time when Titan had not yet made a decision about the contents of the book. Normally I would not want to begin such a project without a clearly defined plan but I was assured that no matter what the book would include Fighting American. It turned out there was good reason for the indecision. 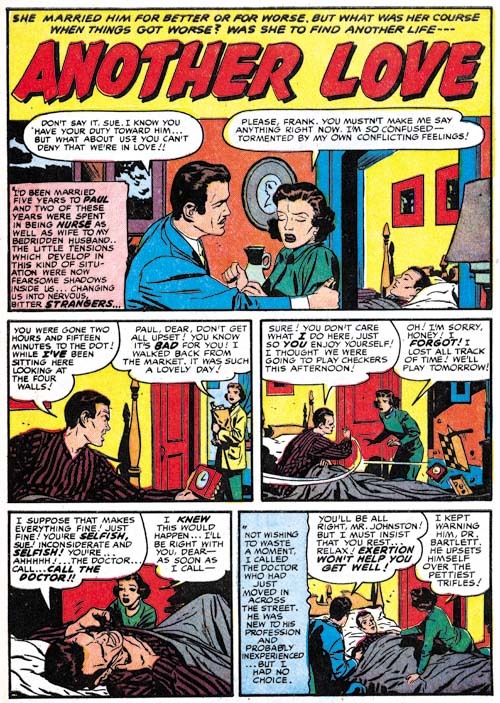 Originally the superheroes were to be done in two volumes but Titan had found a way to publish it as a single book but at a cost that will be a lot less than the two separate volumes. While the prospect of 480 pages of Simon and Kirby should warm the heart of any fan, I must admit it left mine filled with trepidation. How could I come up with a schedule for so much work with such a wide range of restoration challenges? Well I just did the best I could. It turned out that for about a half a year I was able to meet my schedule. Then unfortunately I encountered some restoration problems that seriously threw me out of the schedule. 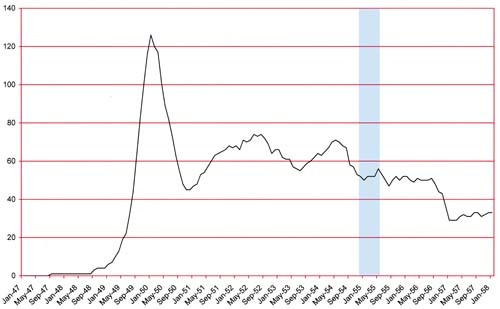 I eventually figured out techniques that allowed me to handle similar problems in a much faster manner but I was never able to recover the slipped time. So in the end my restoration went much beyond the original plan. I am happy to say that Titan believes it can recover from my lateness and still get “Simon and Kirby Superheroes” out with the same release date which is late summer or early fall (Amazon is still listing it as October 12). I am also told that Titan hopes to have advanced copies available for those lucky enough to attend this year’s San Diego show. And what a book “Simon and Kirby Superheroes” will be! The size will be about 7 1/2 by 11 inches. This is the same size as Marvel’s old Visionary line of books which should be able to reproduce the art in its original dimensions. And while my restoration took longer than any of us would have liked this had no impact whatsoever on the quality of the results. In fact I am certain that the reader will find it superior to the work in “The Best of Simon and Kirby”. When I worked on BoSK the Captain America story was about the last thing I did. 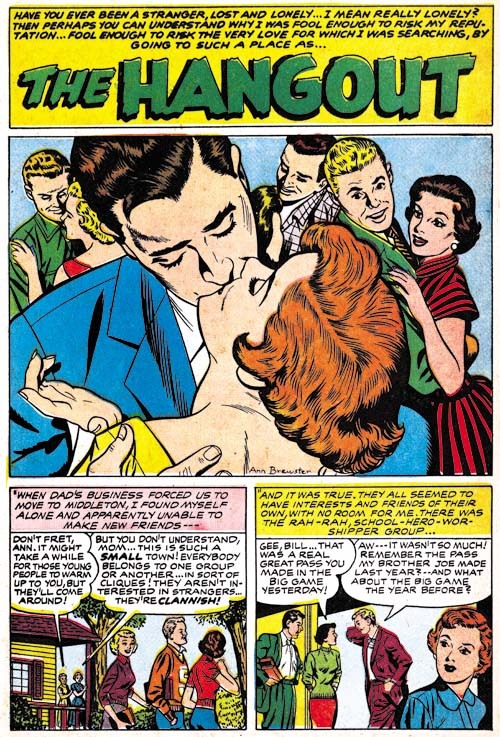 It was done using original flats (proofs of the line art) that Joe Simon had kept all these years. I was so please with the results that I resolved to make use of that technique whenever I could. It means extra work but the results are worth it. 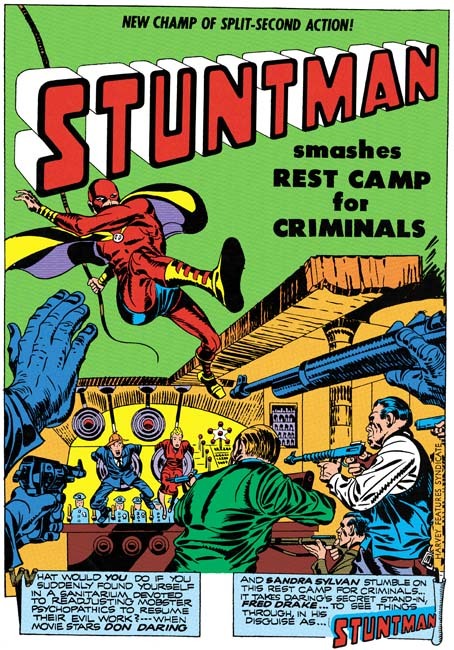 I have not written solely about Stuntman for some time, but only because I posted on it early in my blog (Stuntman). What can I say, Stuntman is filled with great art, action and humor. 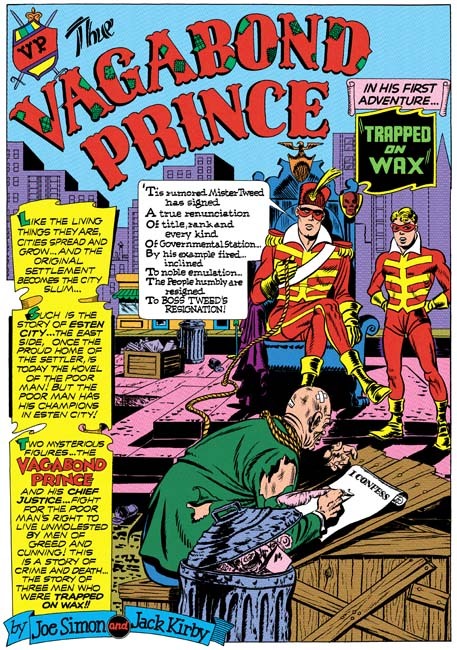 Of course Titan’s upcoming book will have all the published Stuntman stories but as a special treat it will also include the previously unpublished “Jungle Lord”; this thanks to the help of John Morrow (of The Jack Kirby Collector fame). The sudden cancellation of Stuntman left “Jungle Lord” without the finishing spotting but all the lettering and the outline inking were completed. As an additional bonus, two of the Stuntman stories were restored from original flats from the Simon collection. While every effort was made to restore all the scans to the best possible quality you simply cannot beat line art from flats or original art. 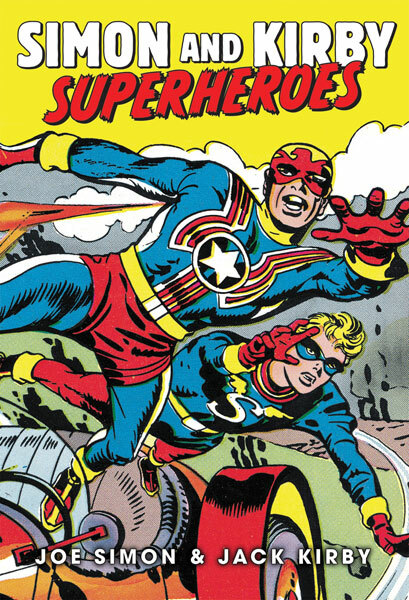 Not surprisingly, Captain 3-D #1 has never been reprinted. Originally it posed a problem for Titan as well. What would they do, offer the book with 3D glasses? The solution I offered was to drop the 3D effect and restore it to the line art. 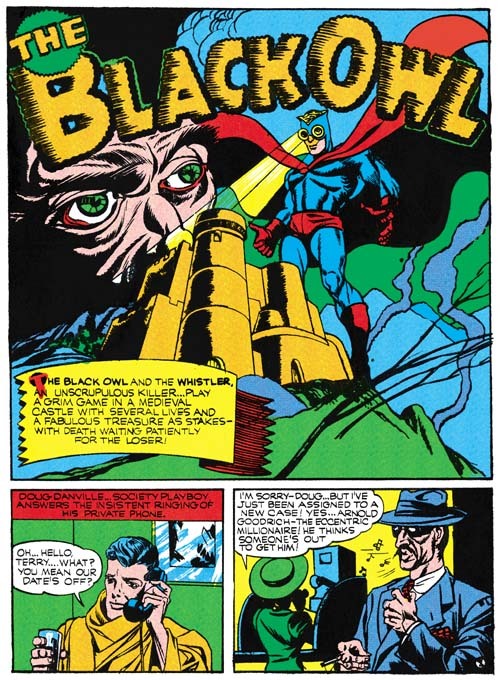 After all Jack Kirby’s perspective was so effective it did not need the 3D gimmick. I have also colored the material in a manner consistent with methods used in other Simon and Kirby productions. 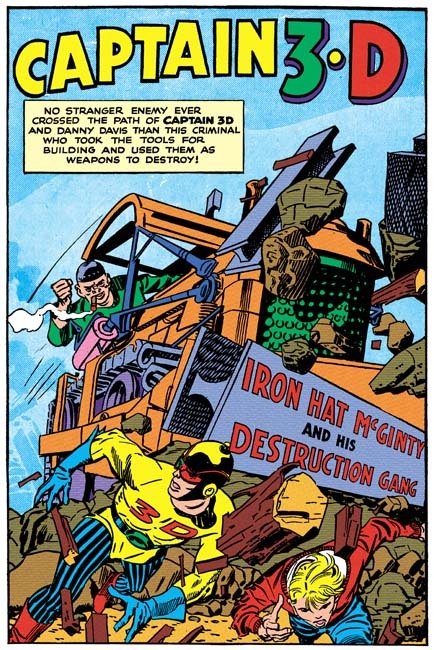 Captain 3-D was inked by an array of artists including the Steve Ditko at the start of his career. Now readers will be able to judge for themselves who inked what; you can get my take on this subject in my post Captain 3D. 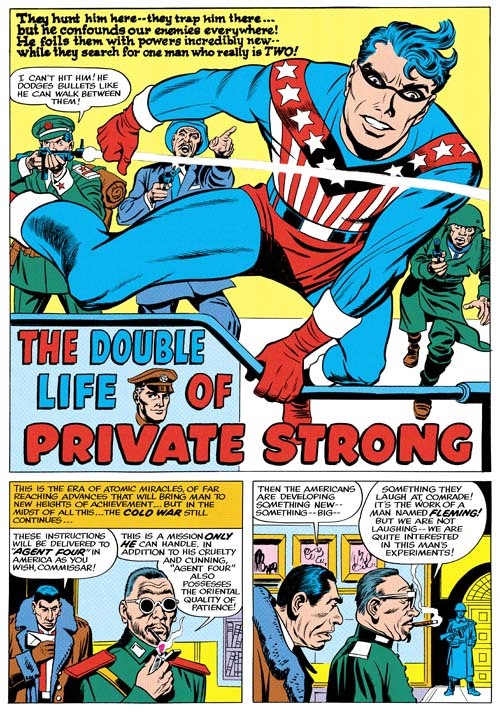 Titan’s book will contain all the original Fighting American stories, not just those with art by Simon and Kirby. 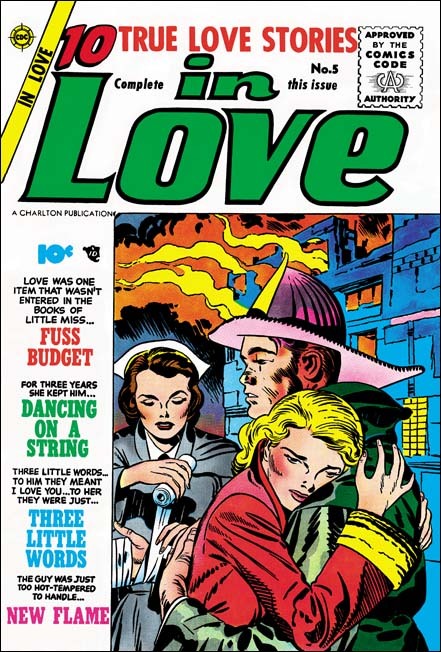 It will include Simon’s cover for Harvey Fighting American #2 and the George Tuska drawn “The Mad Inker” neither of which have been published before. 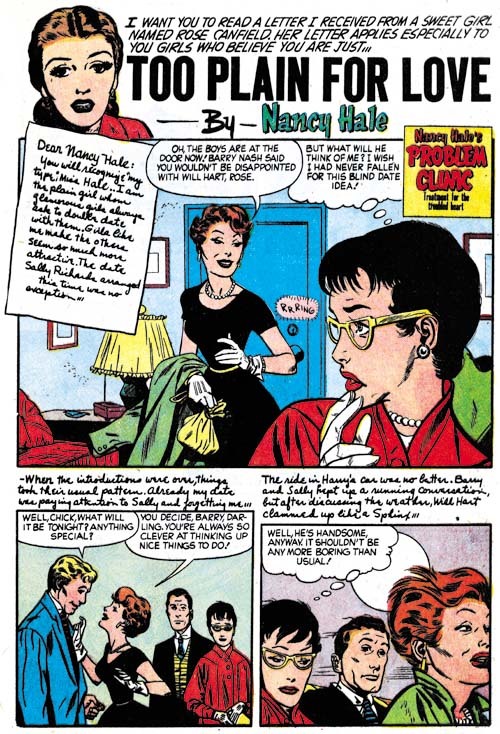 “The Mad Inker” is missing the splash page but this does not seem to affect the story which is otherwise complete. 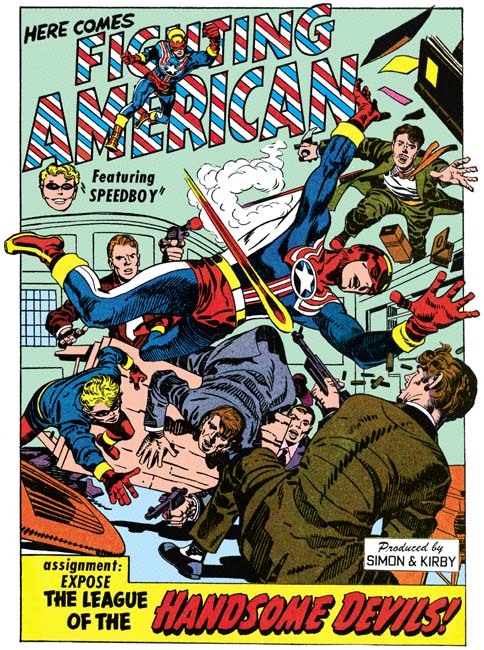 Marvel reprinted Fighting American in 1989 but a good portion of it was what Marvel now terms reconstructed art. In “Simon and Kirby Superheroes” you will get nothing but pure Simon and Kirby. 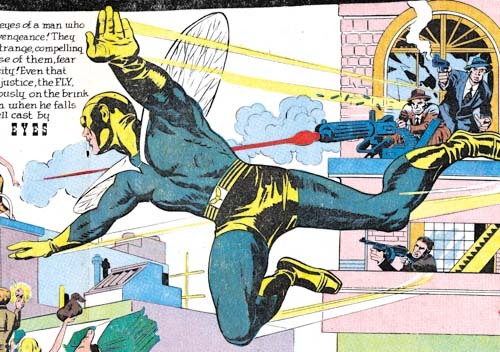 Most of Private Strong and all of the Fly stories were restored from original art. 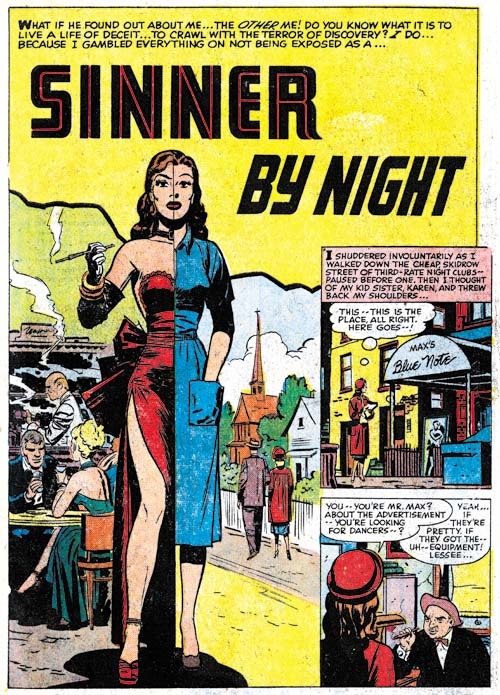 I even got permission from Titan to re-master “Come into My Parlor” which appeared in “The Best of Simon and Kirby”. Not that the restoration in BoSK was that bad but the restoration from original art is just so much more special. There is an introduction by Neil Gaiman. I do not think that for anyone who has read Gaiman’s Sandman series would be surprised that he is a big Simon and Kirby fan. I have to say the fact that Gaiman was going to do the introduction for this book impressed my niece more than anything else concerning the projects I have worked on. There are also a couple of short essays by Jim Simon. 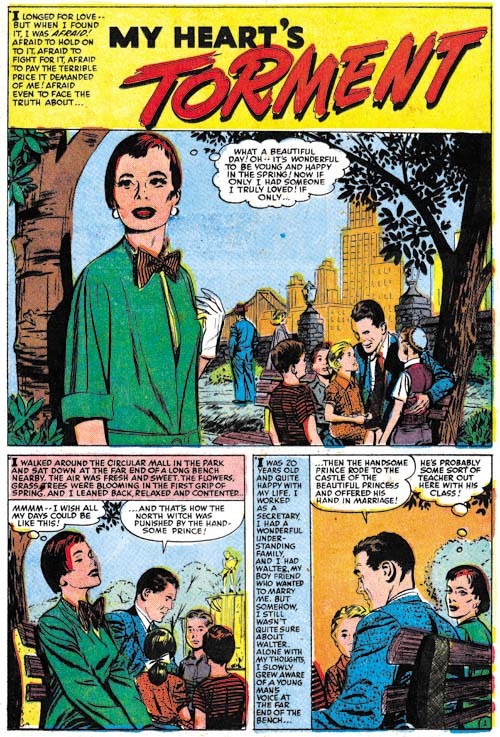 I have not read Jim’s contribution but judging by the introduction Jim wrote for Marvel’s Boys’ Ranch reprint I am looking forward to what he has to say. Future volumes of Titan’s Simon and Kirby library will include great material. But I do not think any of them will so thoroughly cover Simon and Kirby’s collaboration. 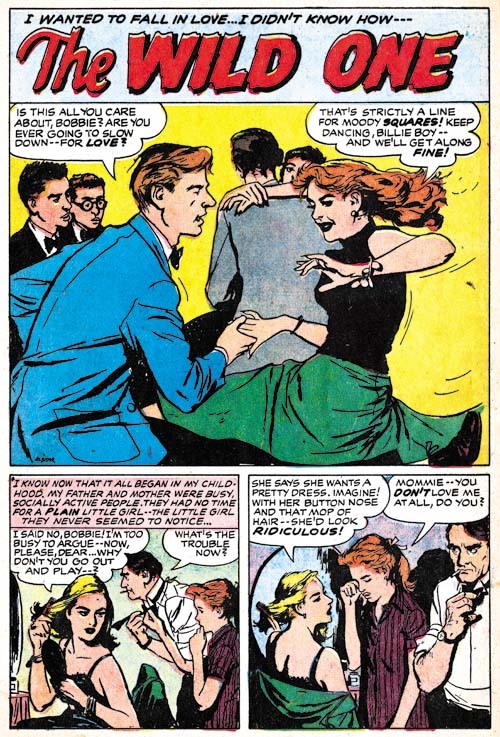 “Simon and Kirby Superheroes” spans from some of their earliest work together until nearly their last (only the retro Sandman for DC was a latter collaboration). 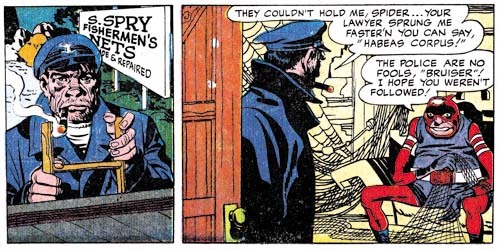 It has been implied on the Internet that some of my recent posts have used restorations from “Simon and Kirby Superheroes”. That simply is not true. However, all the images I have used in this entry are from Titan’s upcoming book. Unfortunately the low resolution of images used for the Internet does not give them justice. The reader will have to buy the book to get the full impact. You will not regret it. There is a great web site devoted to Mort Meskin. 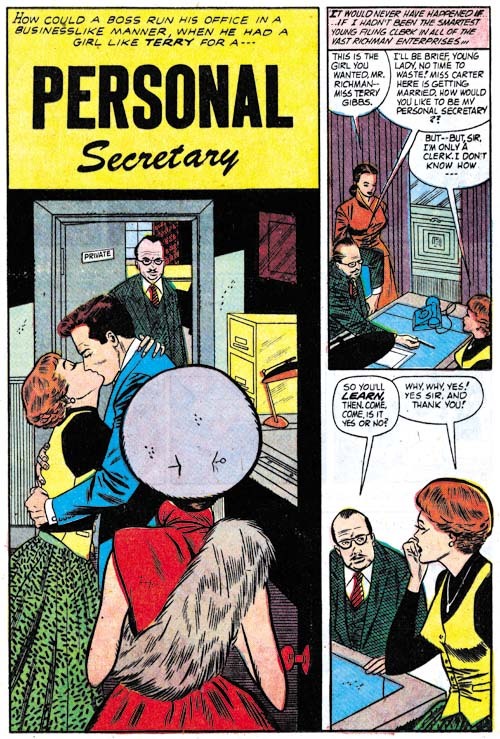 Among its many attractions is a biography that includes a picture of Mort working on a romance page. I have often wondered what story the page was from but until recently I never could place it. 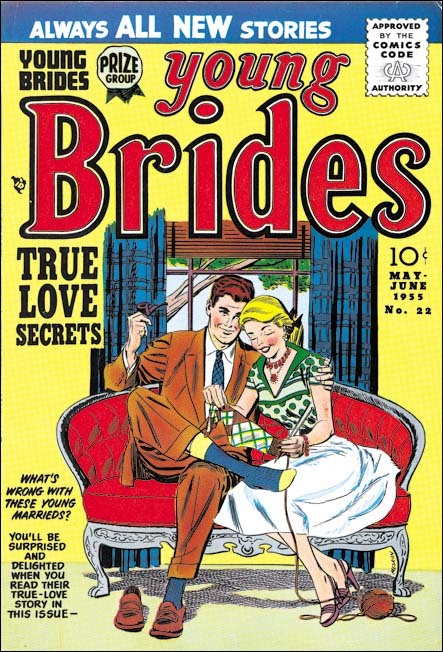 A few weeks ago I spotting it while looking at “My Backwoods Love” (Young Love #10, June 1950). Actually I should have noticed it earlier since I included the splash in one of posts (The Art of Romance, Chapter 11, After the Glut). 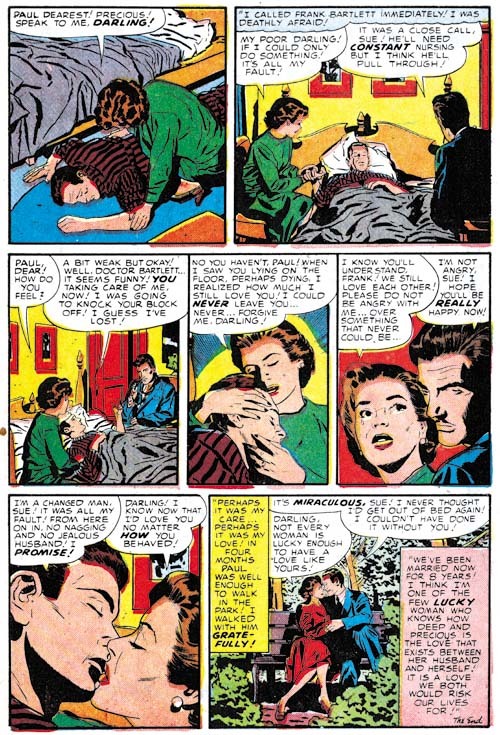 But Meskin did 1033 pages of romance art for Simon and Kirby so a single page is easily overlooked. Comic books dates are a guide to when a title should be removed from a newspaper stand and so are a couple months advanced from the actual release date. Also time must be allotted for printing and distribution. Generally the cover date must be adjusted by 5 or 6 months to arrive at the calendar date for when the art was done. This would place the photograph as being done around January 1950. All indications are that Simon and Kirby did not keep much of an inventory so that date is probably accurate to within a couple of months. 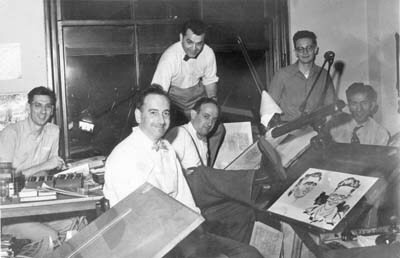 Simon and Kirby studio (probably from 1951 or 1952) Left to right: Joe Genalo, Joe Simon, Jack Kirby, Mort Meskin, Jimmy Infantino and Ben Oda. Caricatures (probably drawn by Joe Simon) of Marvin Stein and Jimmy Infantino. It may not be obvious, but Meskin biography photograph of Mort has been staged. You can tell because he is holding a pencil despite the fact that the entire page has already been drawn and all but the final panel inked. I have seen other photos from this period taken of the Simon and Kirby studio and they are less candid than they try to appear. I show above one of my favorite pictures where obviously no attempt was made to portray this as a candid scene. They might have been hard working artists but you got to think they all enjoyed a laugh from time to time. 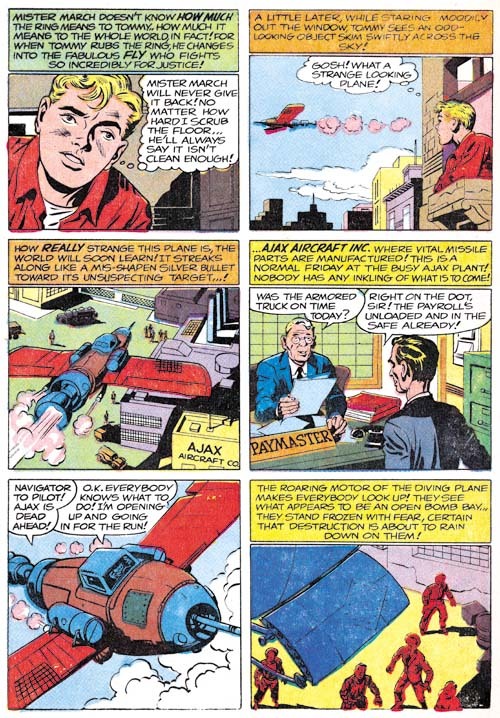 The Meskin website biography states that the rugged man in the upper right panel was drawn by Jack Kirby. I have often wondered whether this was correct. Certainly this character type appears in Meskin’s art very rarely. I can think of only one other example. 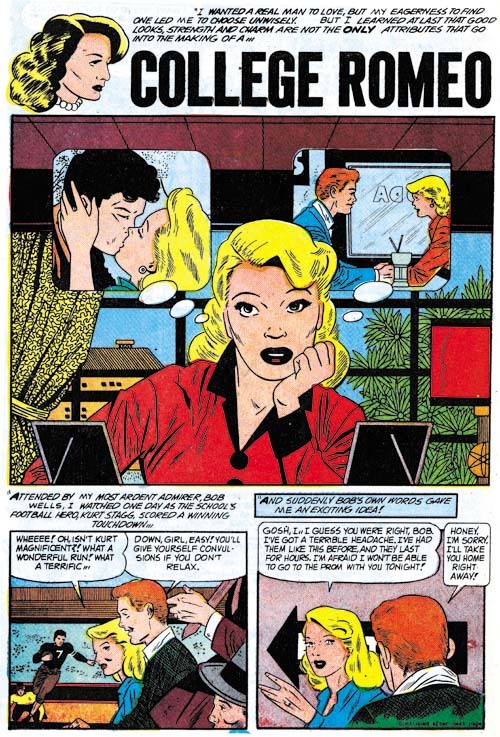 However it should also be said that not many of the stories Mort worked on at that time would call for such a character either. 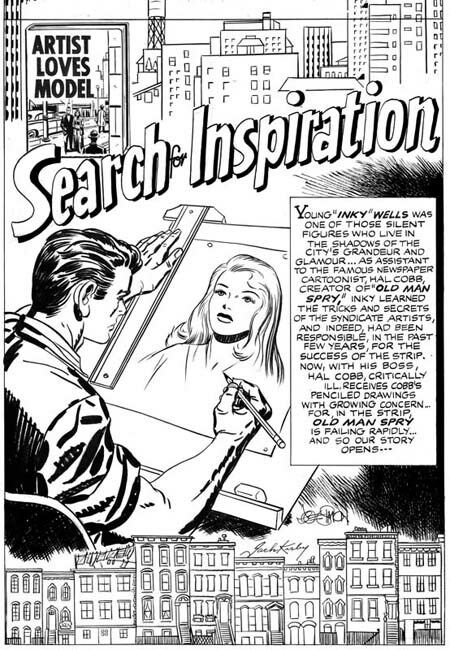 Meskin actually worked in the Simon and Kirby studio (almost all artists working for Joe and Jack did not) so Jack was certainly available to provide a little penciling. But is that what actually happened? 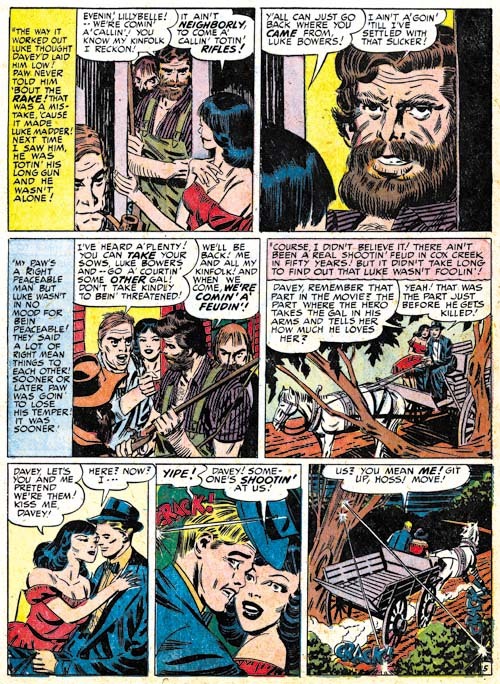 While the features of the man in “My Backwoods Love” are unusual for Meskin remove some of the abundant hair and the facial characteristics do not deviate that much from Mort’s typical man; perhaps only a bit heftier. The rest of the page is typical Meskin. 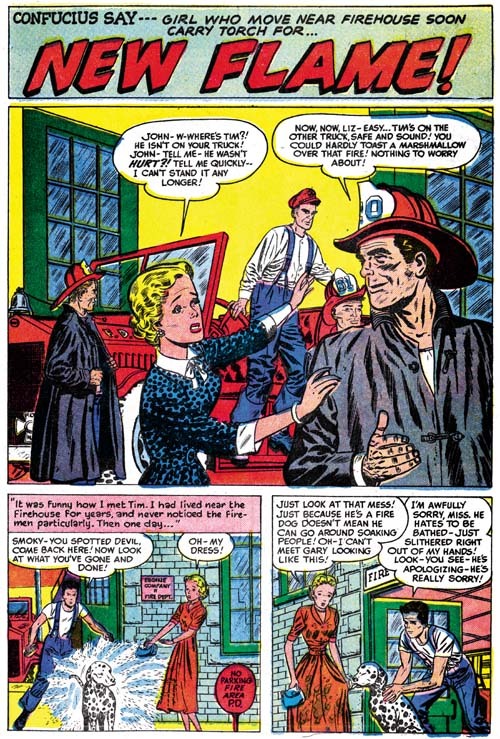 Nor is Kirby providing layouts as has so often been claimed. 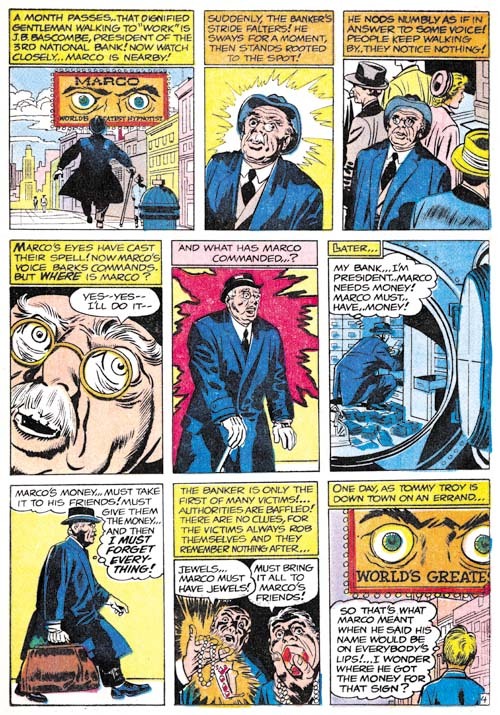 The panel layout includes a lot of vertical captions that Meskin preferred at that time but which Kirby did not. It seems unlikely that Jack would switch his preferences when creating layouts for another artist to use. The other story with a “Kirby” face that I mentioned is “Too Good for Me”. A comparison between the two stories suggests two commonalities. They both have a lot of hair and are close-ups. Beards and mustaches were not commonly depicted by Mort and such fully grown examples are even rarer still. Turning to the close-up nature of these drawing it can be said that Meskin would often modify his inking of features by providing more lines. This had the affect of transforming his generally simply eyebrows into more complicated and interesting ones. This change in eyebrows makes the work look more like Kirby’s since Jack was famous for his extravagant and expressive eyebrows. But while in close-ups Meskin’s depictions of eyebrows become more complicated they really are not done in the same manner as Kirby’s. 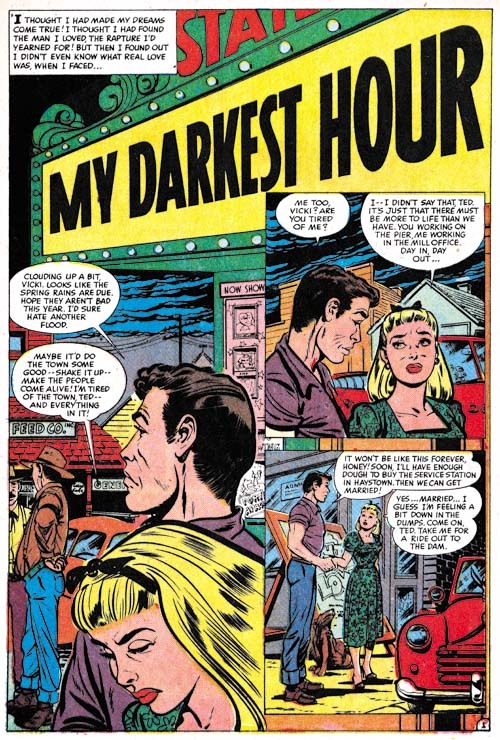 In “Too Good for Me” Meskin makes frequent use of tall narrow panels such as can be seen on the bottom of page 4. 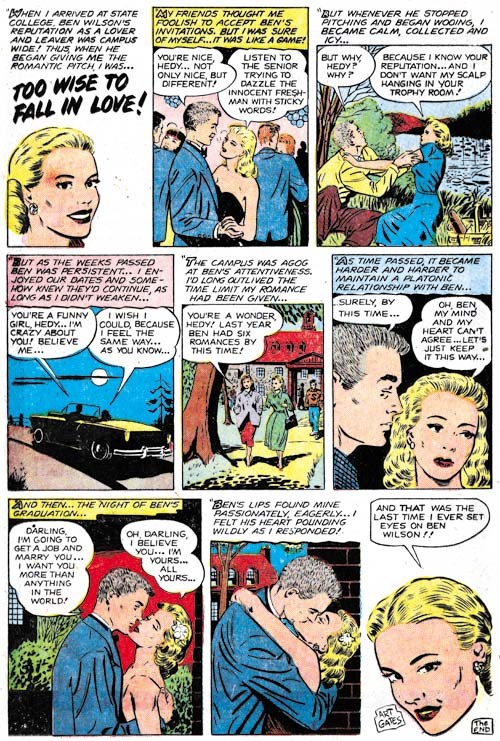 This was a common panel layout technique used by Mort during this period. 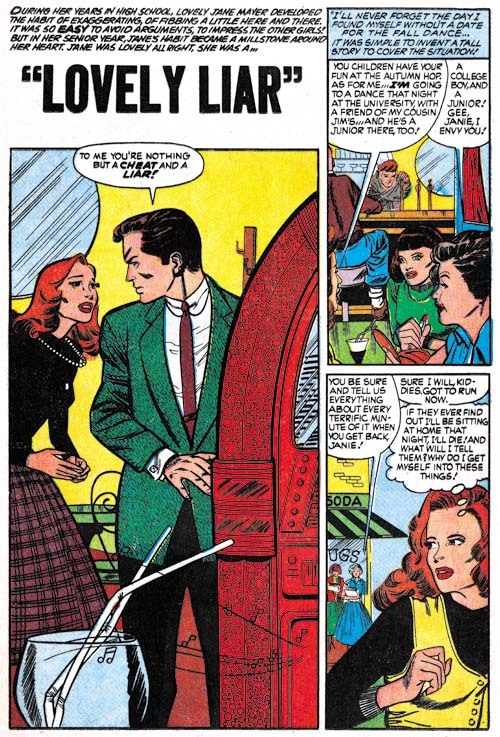 Such tall narrow panels, however, were not often used by Jack Kirby during the same period. 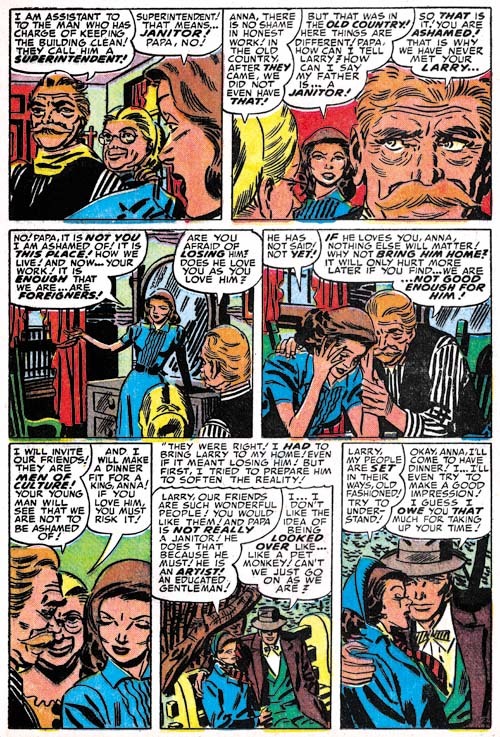 So once again I believe we can dismiss any claim that Kirby supplied layouts for “Too Good for Me”. I cannot completely reject the possibility of Kirby providing a helping hand in the drawing of these particular faces. 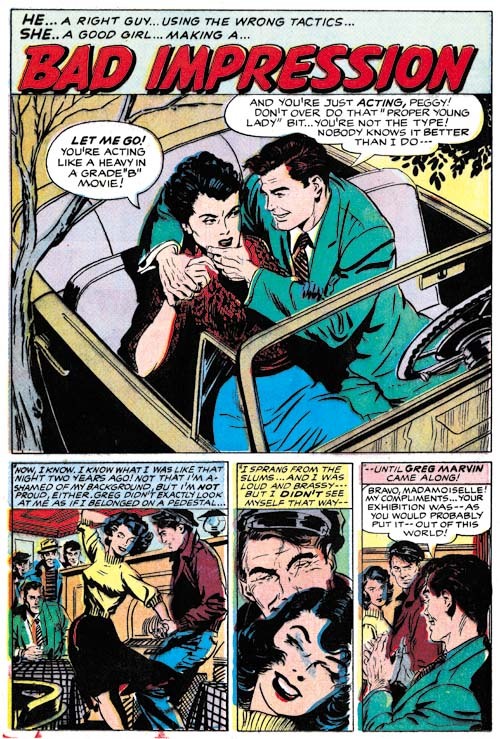 Nor would I deny the possibility of a Kirby influence on Meskin; after all they were both working in the same studio and early work by Mort was influenced by Jack (Early Mort Meskin). However I do believe that these “Kirby” faces were most likely drawn by Meskin without any direct assistance from Jack.